As an author my goal is to write tales that whisk the reader away to worlds of adventure; steep them in romance, and wrap them in magic—bringing to life a believable place and time through fictional characters and events. From the sidebar menu discover Maps and illustrations to follow the characters on their journeys along with printable Character Lists & Glossaries. 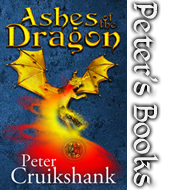 Find out more about Peter Cruikshank’s books, preview samples directly through Amazon©, along with Reviews from other readers, and links to order from multiple on-line retailers. Do you read anything other than Fantasy stories? For years all I read was Sci-Fi, but in recent years I have read a lot of Fantasy. I like the big epic stories that traverses three or more books. I also enjoy Alternative History–for instance I read a series once about what it would be like today if the South had won the Civil War. One of my favorites was a real good book called The Burning Mountain that told how the war would have gone in the Pacific if the U.S. had not dropped the atomic bomb on Japan. The story follows several fictional characters, both Japanese and American. The authors built the story line from research they had Japan’s actual plans for defending the homeland and the Allies plan for attacking the Japanese mainland. Question Submitted by Tom S.
That’s a tough question. A lot of it depends upon what is going on in my life, how long the book is, and probably one of the most factors is how much I am being bothered by another story. 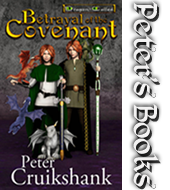 As I wrote the second book in the Dragon-Called series (Betrayal of the Covenant), my mine kept drifting off this character called Rylan, a trainer of dragons, and a sarcastic dragon named Emerald. So in the middle of writing Betrayal, I wrote a smaller (300 page) book entitled The Dragon Whisperer–sending that around to Agents and Publishers at the moment. Regardless, it took me 3 years to publish Betrayal, though I do have to caveat this by stating that my family and moved twice in those three years and I had a cancerous kidney removed. How did you come up with the names for the different creatures? Question Submitted by Penny G.
I base the stories on various Medieval lands (England, Scotland, Wales, Germany, Netherlands, and others). I research the myths of these lands for some of the names, but for others I create names from the language that mean something related to the creature. For instance there is an old Welsh name Tesni that means “warmth”. Today it’s pronounced Tesnee. I named a dragon in the Dragon-Called series Tesne. Another example are creatures that I call Surikats. They resemble large Meerkats, but with human capabilities. The Dutch word for Meerkat is Suricate. Do you have a lot of stories going around in your head at the same time? Question Submitted by Robert T.
Fortunately or Unfortunately–depends upon the day 🙂 Normally I have several stories running through my thoughts. This was the case when I was writing the Second book of the Dragon-Called series, Betrayal of the Covenant. I kept picturing this dragon trainer. 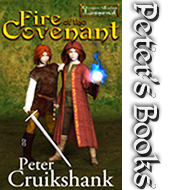 A solitary orphan who gets involved with a sarcastic dragon and draws an odd assortment of characters to him as he tries battles a demon to save a girl and a kingdom. So I wrote The Dragon Whisperer, though I am still submitting it to Agents for representation. I’ve started the Third book in the series, but interrupted it and wrote the Novella, Ashes of the Dragon when a female dragon hunter, who was much more than she even knew. Right now I have three other book ideas and a couple of novellas running through my mine, but I’m really trying hard to focus on the Third book. Wish me luck. Are the characters real to you? Question Submitted by Mickey D.
When someone talks to you, I don’t see how you can think of them as anything other than real. I can be watching TV, driving to the grocery store, working on another book, or any other daily activity when I suddenly hear one character or another speaking to me. It wouldn’t be so bad except I tend to have an internal conversation with them as if they were another person. They tell me about scenes they want to be in and how they think it should go, or how they would feel in a specific situation I’m thinking of writing–their emotions, how they might react. Sometimes they comment on another character. I realize that this is just my Muse, Willow, talking to me. But since Willow constantly changes her appearance–sometimes a woman, sometimes an Elfin, and even sometimes a dragon–I doubt if this is a whole lot better.